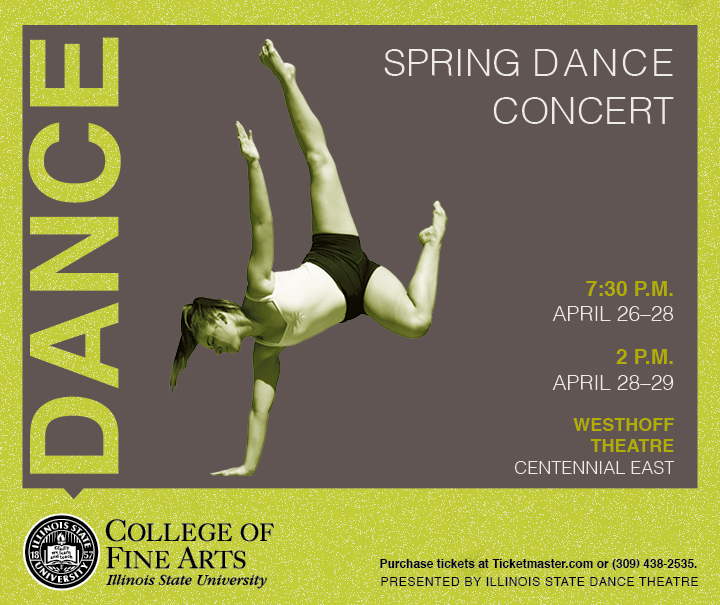 The Spring Dance Concert is an eclectic collection of dances choreographed by guest artists and Illinois State faculty that promises to keep you at the edge of your seat! Witness the athletic virtuosity of the dancers in an intimate, thrust space. $10 for Illinois State faculty and staff. Tickets can be purchased at the College of Fine Arts Box Office, located in the Center for the Performing Arts, from 11 a.m.–5 p.m. Monday– Friday, or by calling (309) 438-2535. Tickets are also available through Ticketmaster.com. Free parking is available in the School Street Parking deck for all performances.